When you are looking for a sporty and fun to drive mid-size pickup, the Toyota Tacoma should immediately come to mind. 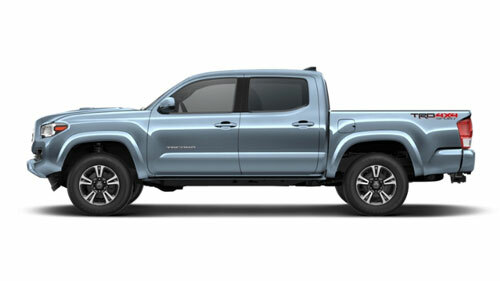 The 2019 Tacoma carries on this pickup's impressive lineage by providing potent powertrains, off-road ready capabilities and stylish design, backed by modern features from Toyota. You can explore the fun to drive Tacoma pickup truck line around Riverside County and Murrieta, California at Gosch Toyota. Shop our new Toyota Tacoma inventory online now to find a sporty Tacoma pickup that you would like to come by and test drive. Our website is also a great resource for learning more about the sporty Tacoma and other Toyota models. To drive the ultimate in Tacoma off-road performance and capability, get into a 2019 Tacoma TRD Off-Road or TRD Pro model; these performance pickups come equipped with an electronic locking and limited-slip rear differential, Multi-terrain Select and 16-inch alloy wheels for enhanced off-road prowess. The TRD Pro model adds TRD-tuned high-performance FOX 2.5 Internal Bypass shocks, TRD Pro skid plate and TRD Pro cat-back exhaust for added performance and off-road capabilities. Visit our local Gosch Toyota dealership near Murrietta, CA and speak to one of our fast and friendly sales associates. Our sales team is highly trained and can answer any questions you may have about the new 2019 Toyota Tacoma. A 2.7-liter, 4-cylinder is the base engine in 2019 Tacoma pickups and boasts 159 hp and 180 lb-ft of torque. While the 2.7-liter engine is plenty capable, Toyota's 3.5-liter V6 is a popular upgrade in the Tacoma and generates a potent 278 hp and 265 lb-ft of torque. Power can be routed to the rear wheels, or, all four wheels, thanks to an advanced 4WD system offered across the 2019 Tacoma lineup. There is also the choice of transmission; both a 6-speed automatic and manual are available on new Tacoma trucks. Help your new 2019 Tacoma stay on the road longer by speaking with our Gosch Toyota service team. Our team can work to maintain any new or used Toyota truck, sedan or SUV. Visit with our team and learn why proper vehicle maintenance is important to the safety of you and your passengers.